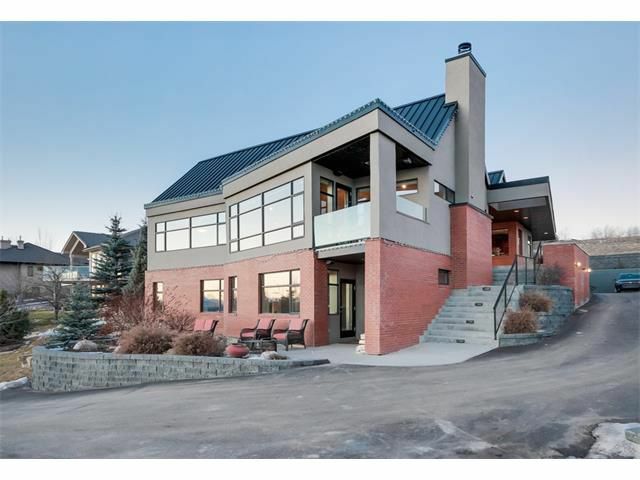 Panoramic mountain views in this stunning walkout bungalow on one of the best lots in the exclusive 'Slopes'. Situated on an elevated .4 acres backing onto an environmental reserve with a wall of windows on both floors facing southwest, this home was architecturally designed to maximize views and light from every room. Designed for entertaining, this home features an open kitchen and living room with multiple islands, coffee station, bar, massive fireplace and mantle with built-ins. 3 bedrooms, main floor den, dual laundry, Brazilian cherry hardwood, custom lighting, custom window treatments (electronically controlled) cherry cabinetry, impressive vaulted ceiling. Extend the entertaining outdoors to the multiple decks and patio areas, complete with full sound system. Private elevator, wine room, air conditioning, in-floor heat, professional landscaping, over-sized triple garage, metal roof. Top quality design and finishing details. Call your favorite Realtor to view! !